Unicorns are supposed to be mythical and of course, magical creatures. After all, only a virgin is supposedly able to ride one, and it is a heinous crime to murder a unicorn, and what’s worse, to drink its blood. 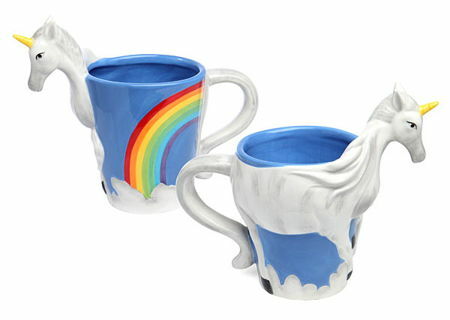 Well, with the $12.99 3D Unicorn Mug, you need not fret about drinking its blood, but you will be able to drink directly from it, with your favorite beverage swishing within. This is an exclusive ThinkGeek creation, where hopefully, it will be able to add some much needed magic to your mornings, especially after you have had a fun weekend and need to get back to your dreary desk at work. Capable of holding 13 oz. of any liquid, it is made out of ceramic. Too bad it does not sparkle.